There are a lot of reasons people question vaccines in a country with the most aggressive vaccine schedule in the world where citizens are not allowed to directly sue vaccine manufacturers for vaccine-induced injuries. 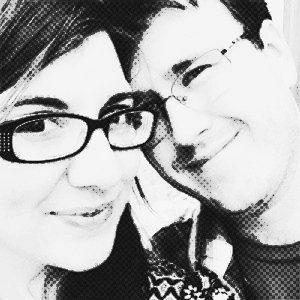 While the censorship rages against the so-called “anti-vax” community to shut down online content that even questions the safety and effectiveness of vaccines on various platforms including YouTube, Facebook, and even Amazon, it’s quietly coming out all over the place that our vaccines just really aren’t as effective as the CDC, Big Pharma, it’s lackeys (again, this), and the pro-vaccine crowd would have everyone believe. Straight away, here are three reasons that have popped up in recent weeks why people are questioning the effectiveness of vaccines. 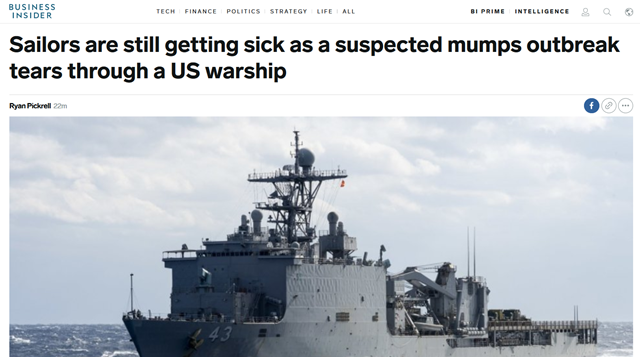 A US Navy warship deployed to the Persian Gulf has been stuck at sea for months due to a viral outbreak of what’s likely the mumps, and servicemembers are continuing to fall ill as the medical workers try to get the situation under control, Fifth Fleet told Business Insider Thursday. If you were not aware, all branches of the US military require a full battery of vaccines for all new recruits. According to this chart on military vaccines administered for Basic Training and Officer Accession Training, updated Feb. 2019, “Measles Mumps and rubella (MMR) are administered to all recruits regardless of prior history”. 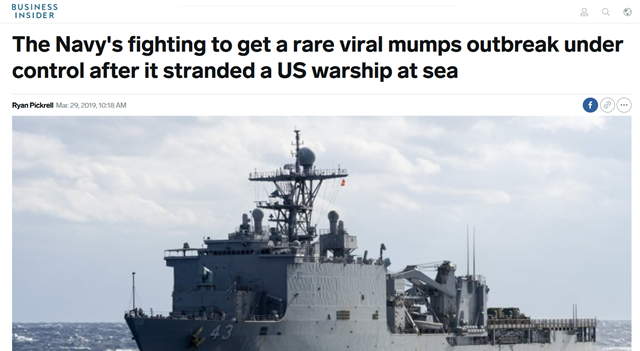 Meaning, that even if these servicemembers received their required MMR vaccines as children, they would have been given yet another upon entering the Navy. 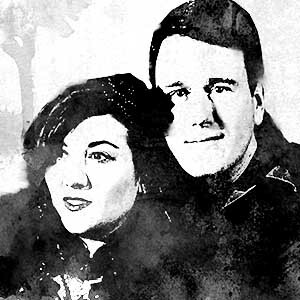 So… Why are they getting mumps? Well, that depends who you ask. The Business Insider promptly changed its headline to add the word “rare”. Meanwhile, what most people don’t know is that two former Merck virologists blew the whistle on the MMR vaccine’s effectiveness nearly a decade ago by filing a qui tam action lawsuit against Merck & Co. in August 2010. 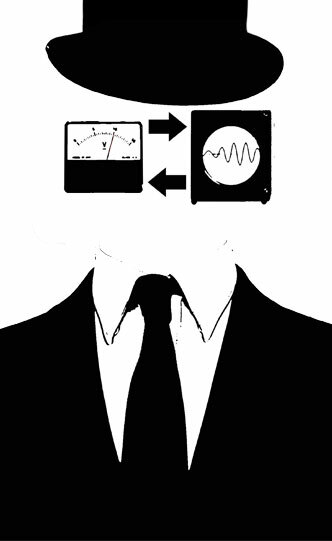 As you can see from the suit, the former Merck scientists claim that “by using improper testing techniques and falsifying test data,” Merck is concealing the fact that the company knows specifically that its mumps vaccine is “far less than” the 95 percent effectiveness the company claims. 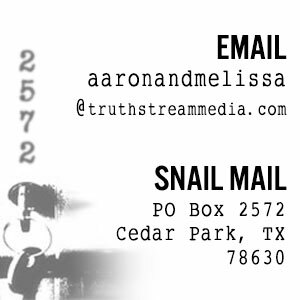 The introduction to the 2010 whistleblower lawsuit against Merck & Co. 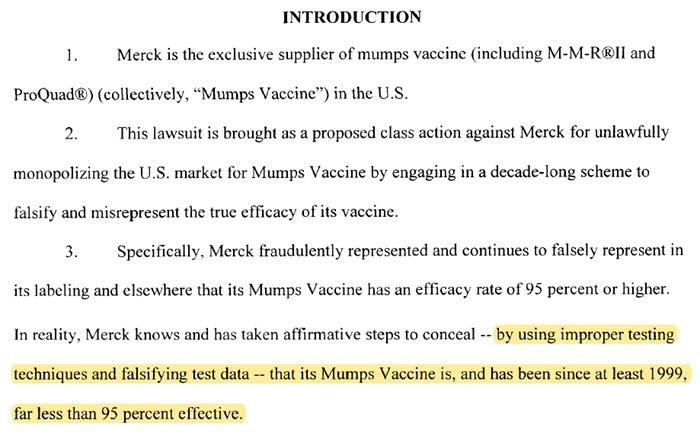 Note that the suit is specifically about the efficacy of the mumps vaccine, including MMR II and ProQuad versions. 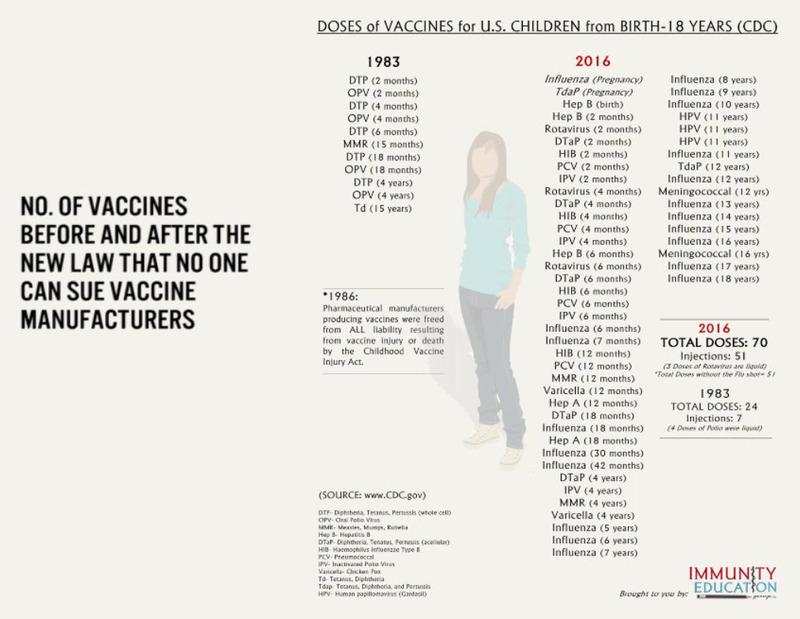 Not only that, but the former Merck virologists also claim this is a “decade-long scheme to falsify and misrepresent the true efficacy of its vaccine”. So this has allegedly been going on since at least 2000, and the lawsuit has been prodding along ever so slowly since 2010. It’s 2019 now. I wonder how long they’re gonna drag this thing out, don’t you? On an MMR aside, it was also reported in the March 2017 edition of the Journal of Clinical Microbiology (Vol. 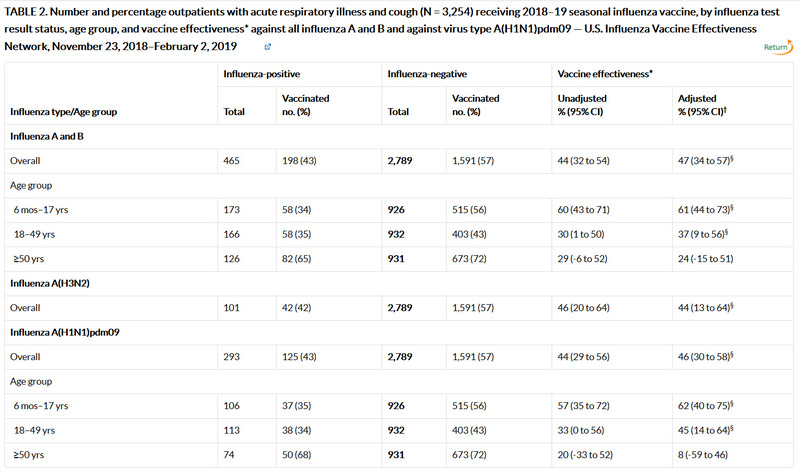 55, Issue 3) that, “During the measles outbreak in California in 2015, a large number of suspected cases occurred in recent vaccinees” and “Of the 194 measles virus sequences obtained in the United States in 2015” a whopping “73 were identified as vaccine sequences”. So there’s that. New technology is allowing researchers to sequence viruses and find out if they are wild — or from a vaccine. On March 14 it was reported that CDC researchers analyzed lab samples from whooping cough patients between 2000 and 2013 and determined that the bacteria that causes whooping cough has undergone genetic changes over time. In short, the vaccination they are currently administering to children for pertussis, including in the DTaP vaccine, is no longer effective because the whooping cough bacteria has mutated. How long has that been the case? Hard to say. 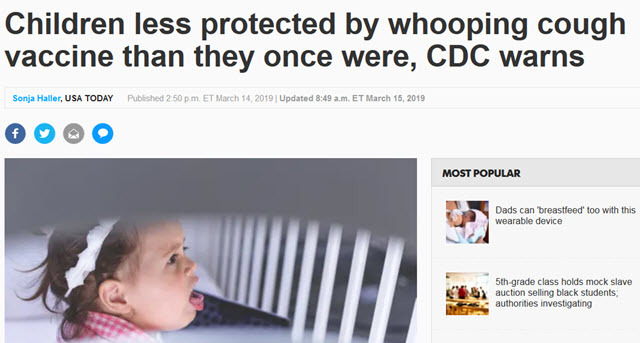 And yet, the USA Today article still went on to claim, “The best protection against whooping cough remains the DTaP vaccine”. “We’re making the best use of the vaccine, while we’re frantically doing research to make a better one,” Dr. William Schaffner, professor of preventive medicine at Vanderbilt University Medical Center, told NBC News. 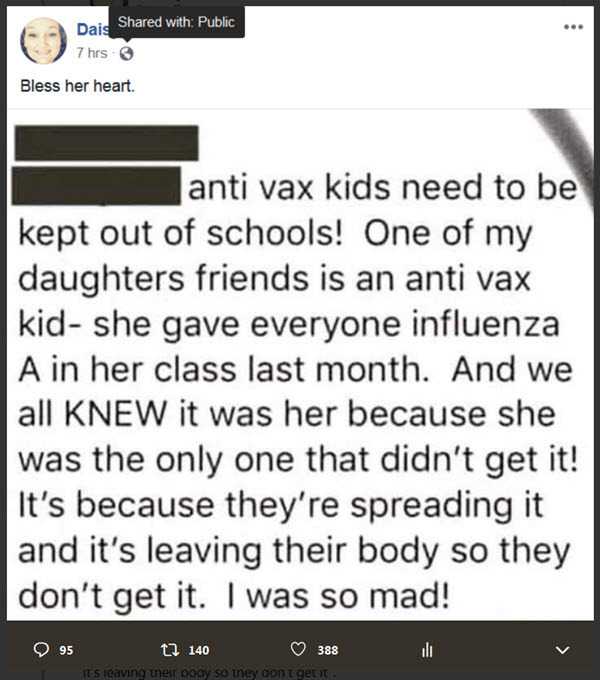 Not sure how they can “make the best use” out of a vaccine that they basically just admitted is pretty well worthless. Dr. Schaffner also noted that a new vaccine for whooping cough “is nowhere near ready”. While the overall adjusted effectiveness for all age groups comes out to 47 percent, the older one gets, the less effective the flu vaccine becomes. That 47 percent actually breaks out as 61 percent overall for ages six months to 17 years; 37 percent overall for 18-49 years; and just 24 percent overall for people age 50 and over. CNN once again spoke to Dr. William Schaffner (guess he’s the go-to soundbite guy on vaccines for our nation’s mainstream media outlets this year?) who said, “those who get flu after receiving vaccine” (Wait, isn’t that supposed to be the point? Taking a vaccine to prevent the flu? Oh sorry, continuing — ) “are less likely to require hospitalization and are less likely to die of the illness”. Is that the best spin they’ve got? How many other times in life is a 47 percent hailed as a success? That’s less than half a chance that the shot is worthless. That logic is just… painful to behold. Maybe now is a good time to point out that major pharmaceutical companies spend billions of dollars every year peddling their wares. By billions, we’re talking nearly $30 billion in 2016 alone. 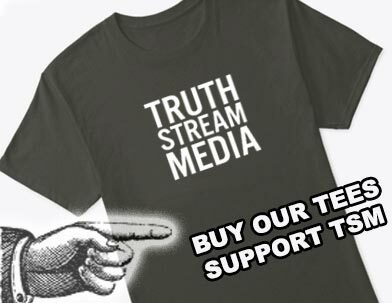 Big Pharma forked over $9.6 billion to mainstream media outlets for the privilege of running direct-to-consumer (DTC) ads that year. That means American viewers saw an astounding 663,000 TV commercials for pharmaceuticals in 2016. You can barely make your way through a show on most major networks these days without at least one generic stock footage filled commercial where a friendly voiceover actor — after listing off a vague set of symptoms followed by a bunch of nightmarish side effects — implores us to become our own drug sales rep and ‘ ask our doctor today’ for whatever drug will supposedly make our lives as great as the people smiling their way through the generic stock footage. 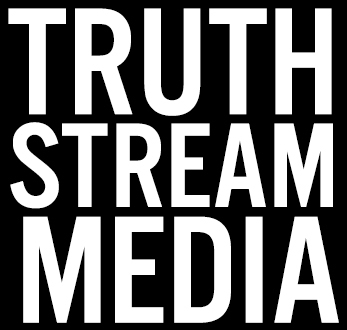 The point, however, is with numbers that substantial, there is no possible way for mainstream outlets to pretend with a straight face that they do not have a vested interest in how their reporters treat topics like, oh, I dunno, vaccines. “If nearly $10 billion was spent on advertising, where did the other $20 billion go?” you might ask. Well, dear reader, it went to persuading doctors and other medical professionals (who may or may not get interviewed by media outlets for their “professional” opinion) of “the benefits of prescription drugs”. The establishment figures that sell vaccines and the corporations that produce them act like vaccines are completely risk-free, so even if there’s only a ghost of a chance a vaccine will actually be effective as promoted or promised, then it’s worth it. The problem is, more and more people are realizing that vaccines are not 100 percent safe and without side effects. Those side effects are worth discussing, especially when we’re dealing with vaccines which the CDC has admitted are not as effective as they should be or Merck scientists-turned whistleblowers are litigating over. Ahem. Why not? Doesn’t that seem like an important thing to evaluate?? The government’s no-fault Vaccine Injury Compensation Program (VICP) has paid out $4 billion to vaccine injured Americans since it was set up in 1986. That’s the same year Congress signed the National Childhood Vaccine Injury Act, which in essence set up a system that does not allow Americans to directly sue vaccine manufacturers for vaccine injuries. It’s probably not a coincidence that the schedule of vaccines went from seven injections and 24 doses in 1983 before this legislation was passed, to a whopping 51 injections of 70 doses by 2016. 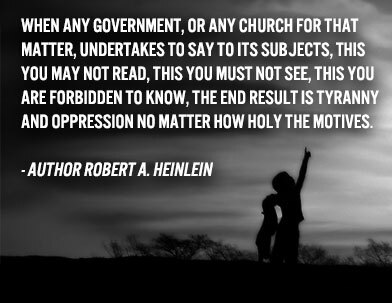 We the People have to be able to talk about vaccines.